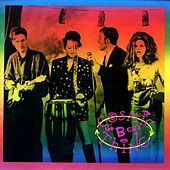 Cosmic Thing documents two very significant events in the B-52's career. First, it is the band's most mainstream album ever, spawning a certain huge hit song about a Chrysler as big as a whale that you may know. The professional wackos had ironed out just enough of their quirky underground kinks to appeal to an audience that just wanted to dance. The B-52's were ready to deliver. They'd lost guitarist Ricky Wilson to AIDS, but rather than making their first album since his death a somber eulogy, the band created a jubilant celebration of life, dancing and the passionate power of having fun.